A Shepherd's Heart: RLK Ministries Update: 10 Year Anniversary! RLK Ministries Update: 10 Year Anniversary! Although this is more of my personal / ministry Blog, I wanted to share the following message with you that I sent to my ministry partners. 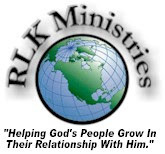 In April of 1997 God started a work that you've come to know as RLK Ministries. This month we celebrate our 10 Year Anniversary! It's exciting times and we plan on continuing to build upon the foundation the Lord has built as He leads! In celebration of our anniversary we'll be making some new additions to our web site in the weeks to come. In order to keep you abreast of what ministry services/projects we're currently working on, as well as resources and financial needs we have, this page will simply list these items. We'll eventually have information on this page so those who are led can give online. In sum, this page will keep you up to date regarding specific short term and ongoing ministry needs so you're aware of them and can pray and contribute as God leads. In the Old Testament, each time God did something significant He had the people build an altar, made of stones/rocks, or sometimes it was simply a large pile of rocks, to commemorate what He had done and this memorial was for their sake and for future generations to see. We likewise can build a memorial of God's goodness, deliverance, and grace "one stone or rock at a time". This will be a place (possibly connected with a BLOG of the same name) where people can share their story, share a special blessing or encouragement from the Lord and, be encouraged, built up, and blessed by what God has done! In sum, anything that points to and gives glory to God will be considered for posting as each item is significant and should be another rock of remembrance for all to see. If you have something to share please submit your story for thoughtful review and consideration via e-mail to livingstones@rlkministries.org . You'll be notified if your submission has been selected to post on the page. We plan on adding more audio resources in the future and we also plan on adding more presentations, training material, and other useful resources for study as well as other practical items. We'll be adding more links to the site to a variety of Christian and other resources. We'll be adding links for kids as well and plan on including some of our kid's favorite online places. In addition to the web updates, I'm looking forward to restarting the Devotional Starters after a several month hiatus. I'm also seeking various other ministry/pastoral service opportunities wherever God wills. Many of you have been with us since the beginning of this ministry and I want to express what a blessing it has been to serve you and the Lord! No matter what direction God takes us, I/We want to be found faithful to His call. Thank you for partnering with us through your prayers, encouragement and support! We look forward to another 10 plus years of serving you and the Lord through this ministry!